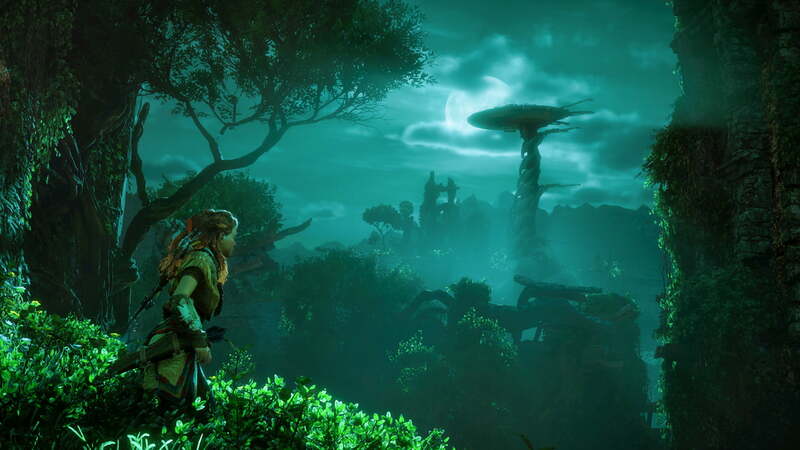 On its face, Horizon: Zero Dawn looks like just another open-world action game, with tonal shades of Shadow of Mordor and Far Cry Primal. And after spending some four hours playing Guerrilla Games’ upcoming title, the game feels similar to that idea, but also reflects the influence of more story-driven RPGs like Mass Effect and The Witcher 3. Those latter influences infuse Horizon with potential, especially in a field inundated with games just like it. Your moment-to-moment time with Horizon feels a lot like action-heavy open-world games, such as Watch Dogs 2, Assassin’s Creed and Far Cry, but it mixes those ideas with a much stronger role-playing game slant than what we’ve seen in demos and previews up to this point. It turns out, while Horizon is often about fighting and riding robot dinosaurs, it also puts a major emphasis on its narrative. Set in a world that exists well beyond a world-ending calamity — a post-post-apocalypse — it follows members of tribes of pre-industrial people trying to exist in a world in which they are not the dominant species. That honor goes to some scary robots that behave like animals. 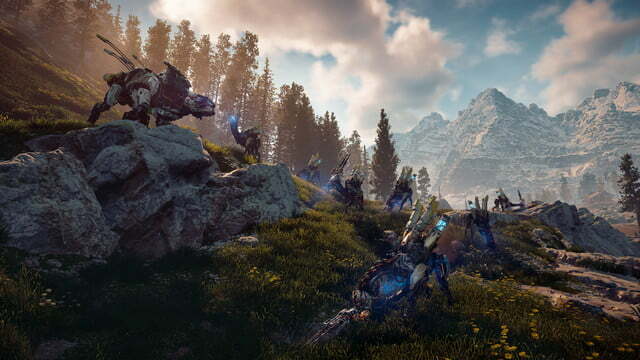 The player character, a young woman named Aloy, finds herself running around this world, fighting robots and humans alike. 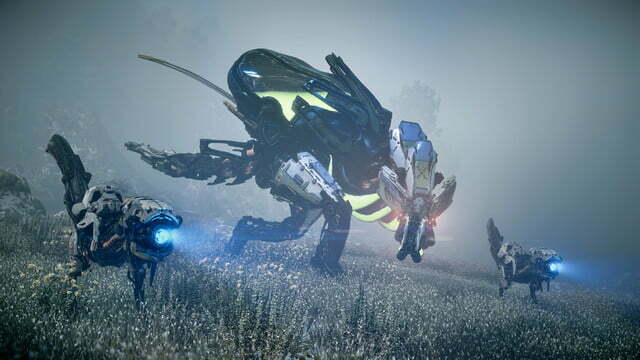 It turns out, while Horizon is often about fighting and riding robot dinosaurs, it also puts a major emphasis on its narrative. 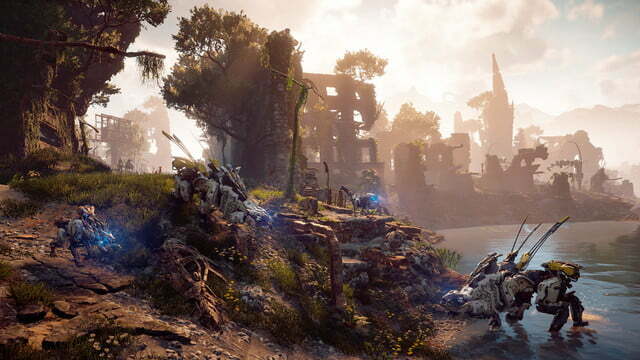 According to Lead Writer John Gonzalez, Horizon began with a concept with many of the main ideas of the game. The robot dinosaurs, a rebooted world, and tribal societies were all part of the original vision created by Art Director Jan-Bart van Bleek. Coming up with a story that made those elements make sense was a job that came later, when Gonzalez joined the team around three and a half years ago. The portion of Horizon we played featured that story heavily. 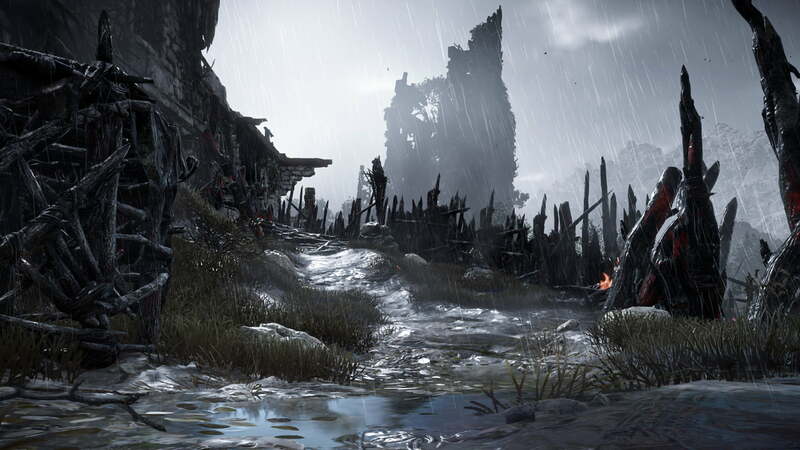 It showed a game that’s more of an open-world RPG than might have been initially apparent — something that hews more toward Fallout 4 than Assassin’s Creed. 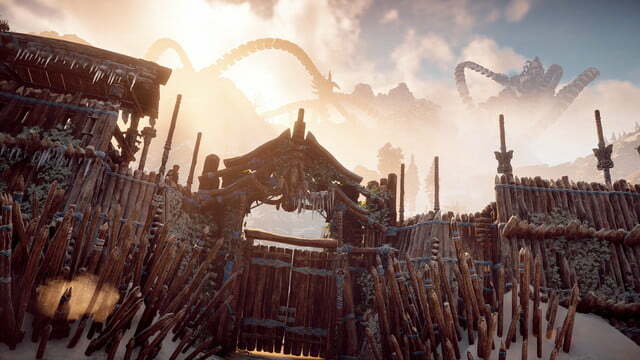 It turns out that unlocking the mysteries of Aloy’s past and her world will likely be as big a draw as the robotic creatures dotting Horizon’s landscape. Players familiar with open-world RPGs will recognize a lot of the bells and whistles of Horizon right away. Once the game lets you loose in its wilderness territory, there are quests to run down: main quests that advance the game, and sidquests to be discovered along the way. What’s surprising is how long it takes for Horizon to let players off that leash. Instead, the beginning takes its time setting up the world players inhabit. 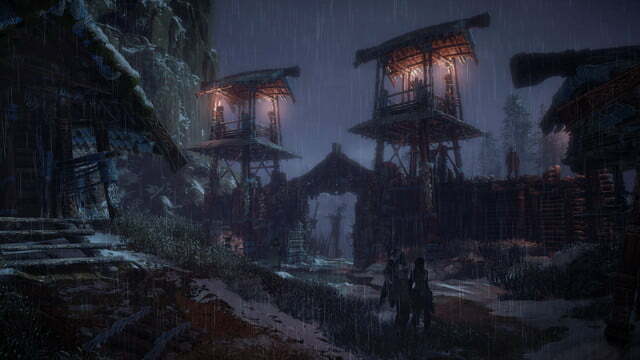 The game opens with lengthy cutscene in which Rost, an outcast from a tribe of people called the Nora, carries a baby Aloy up to a ritual site. The scene shifts, and we take control of Aloy, now about nine years old, as she discovers a key piece of ancient technology that players rely on for the rest of the game. It’s a sort of augmented reality visor that creates a heads-up display overlay on the world, similar to Batman’s “Detective Mode” from the “Arkham” games. During this early portion, players encounter a few key moments that set the stage for how Horizon will tell its story. Horizon features moments called “Flashpoints” where players have to make a key decision of how to react or respond to another character. 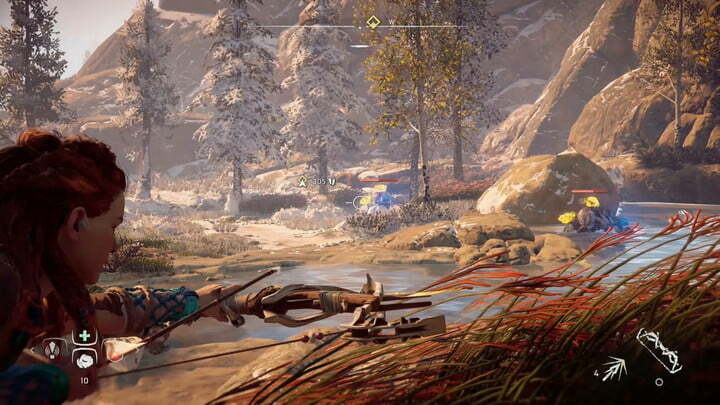 Players can choose whether Aloy responds with force, uses her intellect, or chooses to act with compassion. How players respond to these moments can shape the narrative, Gonzalez explained. Horizon contains 10 hours of Mass Effect-style interactive dialogue, as well, Gonzalez said, and it comes up in conversations all the time. Players can choose Aloy’s responses in conversation, often learning more about the world, characters, and context, if they choose. There’s only one ending to Horizon, Gonzalez said, but players can shape a lot along the way. That doesn’t mean you’ll branch the story one way or another like you might in Fallout, potentially cutting off content. But it does mean characters will react to your choices further down the line. While players may find themselves driven to solve the mystery at the heart of Horizon’s lore — the catastrophe that plunged the world into its current state — Aloy’s personal story is the heart of the story: She doesn’t know her parents or her origins, and is desperate to discover them by any means necessary. The larger mystery began with figuring out what logically led from a world like what we know to the original Horizon concept, Gonzalez said. He had to figure out a way to make the concept make sense to players, while also giving them something to unravel through the course of the game. 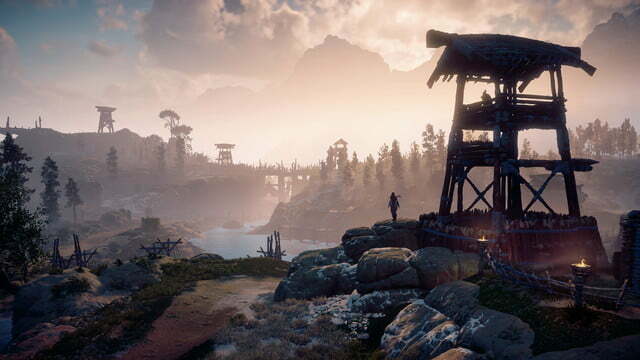 Gonzalez said that balance, along with the action-focused gameplay on offer, will hopefully make Horizon stand out in a market flush with open-world games. Even after four hours, it was tough to get a sense of whether or not Horizon will be able accomplish the goals Guerrilla Games has set out for it. But the demo was surprising in how dedicated it was to bringing players into the story of Aloy, her people, and her world. 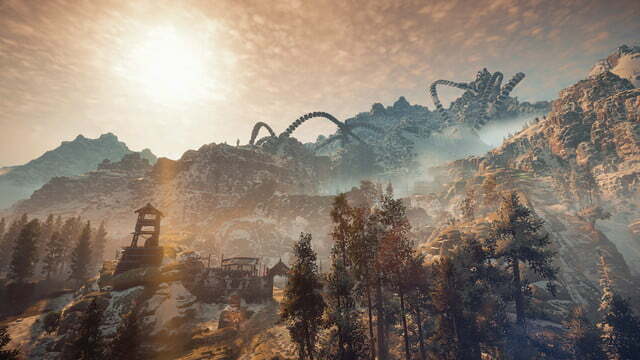 What is clear is that Horizon has a lot to discover — perhaps more than is immediately obvious from its post-apocalyptic concept and the lumbering robotic animals that capture players’ attention. Horizon: Zero Dawn comes to PlayStation 4 February 28.